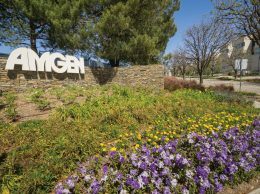 Thousand Oaks-based Amgen is laying off 226 people at its headquarters as part of a restructuring of its research operations. Worldwide, the R&D shakeup will affect 380 staff members, but the company’s headquarters are bearing the brunt of the cuts. The company said the layoffs are not “an across-the-board reduction in R&D, but rather targeted, strategic reductions,” according to a news release. Amgen said the employees are being notified personally beginning today and that they will receive severance packages of cash, health insurance and career transition services. Amgen, the world’s largest biotechnology company, has been grappling with how to deal with the introduction of biosimilars in the United States. Already available in Europe, biosimilars are the biotech analogue to generic pharmaceutical drugs and are expected to put pressure on the prices of biotechnology drugs. Amgen shares rose about a quarter of a percent to $57.41 in midday trading.